German author; born at Jever Sept. 10, 1817; died at Hamburg April 4, 1856. He was admitted at an early age to the Jewish free school at Hamburg, and in 1831 entered a printing establishment at Brunswick as an apprentice, remaining there as journeyman until 1839. On his return to Hamburg he devoted himself to literature, but shortly afterward, aided by Solomon Heine, he went to Paris for further study. In 1841 he returned to Hamburg and resumed his literary work. 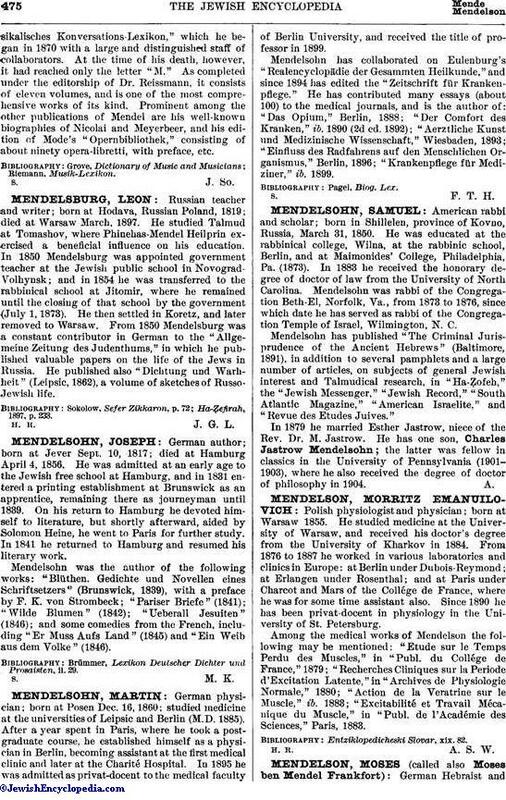 Mendelsohn was the author of the following works: "Blüthen. Gedichte und Novellen eines Schriftsetzers" (Brunswick, 1839), with a preface by F. K. von Strombeck; "Pariser Briefe" (1841); "Wilde Blumen" (1842); "Ueberall Jesuiten" (1846); and some comedies from the French, including "Er Muss Aufs Land" (1845) and "Ein Weib aus dem Volke" (1846). Brümmer, Lexikon Deutscher Dichter und Prosaisten, ii. 29.